Leading referee Jonathan Kaplan has been rested for the World Cup warm-up Tests after sustaining injuries during a road accident in South Africa last week. Kaplan - the world's most experienced Test referee - was riding his scooter in Cape Town when a taxi door opened in front of him. Kaplan needed 30 stitches and was forced to withdraw from the Currie Cup clash between the Blue Bulls and the Free State Cheetahs. With the World Cup around the corner, IRB referee manager Paddy O'Brien is keen to wrap his star whistleman in cottonwool to ensure he is in peak fitness for the 2011 showpiece. 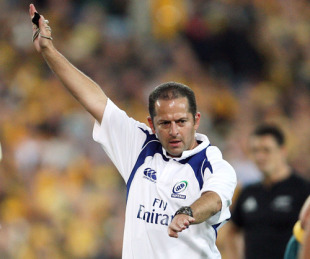 "Jonathan is an exceptionally fit Referee and he will be fully ready for the start of Rugby World Cup," O'Brien said. "Rather than rush him back to action, we took the decision to give Jonathan the best possible environment to return to peak fitness and conditioning ahead of the Tournament." "The rehabilitation programme is underway and Jonathan is scheduled to referee the final two rounds of the Currie Cup to get match time ahead of Rugby World Cup. I would like to wish him a speedy recovery." Kaplan had been due to take charge of Wales' game with England on August 13 and Ireland's match against France on August 20. And Kaplan was also set to run the line during England's clash with Wales on August 6. However, he has now been replaced by Alain Rolland for the August 13 clash while Craig Joubert will whistle the Ireland versus France game on August 20. Ireland's George Clancy will act as assistant referee for this weekend's clash between England and Wales in place of Kaplan.